The United Nations Security Council decided in October 2007 to extend the mandate of the MINUSTAH (United Nations Stabilization Mission in Haiti) through Oct. 15, 2008. 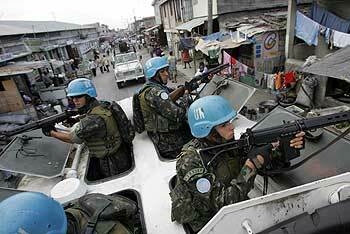 The Brazilian government is responsible for coordinating the MINUSTAH forces that include approximately 9,000 troops. Yet there is very little discussion in Brazil about the country's role in the occupation of Haiti, and especially, about the accusations leveled against the United Nations troops for their participation in human rights violations. One of the cases documented by Haitian human rights organizations was that of the massacre that took place on Dec. 22, 2006 in the Cite Soleil area of Port-au-Prince, following a protest by some 10,000 people who demanded the return of President Jean-Bertrand Aristide and the withdrawal of foreign military forces. According to reports by local residents and video footage recorded by the Haiti Information Project, the United Nations forces attacked the community and killed about 30 people, including women and children. In response to the criticism by human rights organizations that denounced those killings, MINUSTAH justified its actions by claiming that it was combating gangs in Cite Soleil. However, the images shot by H.I.P. show that United Nations troops shot unarmed civilians from helicopters. Inter Press Service, which covered the conditions in the area immediately following the attack, reported finding high-caliber bullet holes in many homes. H.I.P. director Kevin Pina accused MINUSTAH of participating together with the Haitian National Police in summary executions and arbitrary arrests. He concluded, "In this context, it is hard to continue seeing the United Nations mission as an independent and neutral force in the country." Camille Chalmers, a Haiti University professor and member of the Haitian Platform for Social Movement Integration, explained in an interview with journalist Claudia Korol of the Adital Agency: "MINUSTAH tried to build legitimacy by saying that it is fighting criminals. But many people realize that the only things that can truly reduce the lack of safety are public policies and social services. Unfortunately, what we have is a violent military apparatus." Another violent military operation occurred in July 2005, when an estimated 22,000 bullet holes were found after an operation by MINUSTAH in Cite Soleil. Reports by H.I.P. cited accounts by residents that the wounded and dead were found inside their own homes. These accounts charge that soldiers shot at people indiscriminately, which had devastating effects in a neighborhood where housing conditions are extremely precarious. These accounts also charged that MINUSTAH did not allow the Red Cross to enter the area—a violation of the Geneva Convention. United States government confidential documents, obtained by human rights organizations through the Freedom of Information Act, show that the American Embassy knew that the United Nations troops planned an attack on Cite Soleil. Local community organizations believe that the goal of the military was to prevent a demonstration commemorating ousted president Jean-Bertrand Aristide's birthday, which was on July 15. A report by Project Censored estimates that more than 1,000 members of Lavalas, a loose organization that groups supporters of Aristide, were arrested and about 8,000 people killed during the "interim government" that ran the country from 2004 to 2006, following the coup against Aristide on Feb. 29, 2004. Camille Chalmers characterizes this action as an "intervention led by the governments of the United States and France." He further explains that "solidarity with the people of Haiti means helping to rebuild the country and find answers to the most pressing social problems, and the military presence does not help. The goals of security and human rights have not been met. On the contrary, we believe that the presence of MINUSTAH constitutes a violation of the Haitian people's right to self determination." On Feb. 2, 2007, United Nations troops conducted another operation in Cite Soleil that resulted in the deaths of two young women who were sleeping in their homes. On Feb. 7, various demonstrations took place in the country, and on Feb. 9, there was another military attack, which was denounced by local organizations such as the Institute for Justice and Democracy in Haiti. On Oct. 30, 2007, the kidnapping of Dr. Maryse Narcisse, who is a member of the national leadership of Lavalas and worked with health and education social programs in Haiti, was made public. Another member of Lavalas, the psychologist and human rights activist Lovinsky Pierre-Antoine, disappeared on Aug. 12. Local organizations accuse the United Nations troops of generating public instability and attacking those who defend democracy and human rights. The Brazilian Bar Association (Ordem dos Advogados do Brasil, O.A.B.) led an observation mission to Haiti in late June 2007 and concluded that MINUSTAH plays a "violent" and "repressive" role that cannot be characterized as a "humanitarian action." Anderson Bussinger Carvalho, the lawyer responsible for the report, called for the withdrawal of Brazilian troops from Haiti. "I have concluded that the presence of Brazilian troops is not humanitarian. It is a strictly military mission. Haiti has a history of military occupations and Brazil ends up playing a role in this history," said Carvalho in an interview with the newspaper A Folha de São Paulo (Sept. 4, 2007). The role played by Latin American countries in Haiti today is similar to the one played by the multilateral forces that stayed in the Dominican Republic following the invasion by the United States in 1965. The Dominican Republic had suffered under a long military dictatorship that lasted until 1961 when longtime dictator Rafael Trujillo died. In 1962, Juan Bosch was elected president but was deposed by a military coup after seven months in power. In April 1965, a series of widespread demonstrations demanded the return of ex-president Juan Bosch. It was during that time that President Lyndon Johnson ordered a military invasion of the Dominican Republic by 20,000 marines. A few weeks after the invasion, the Organization of American States sent in the Inter-American Peace Force of 1,129 soldiers. During that period, while Brazil was under a military dictatorship, the role of Brazilian troops in the Dominican Republic was similar to the one they play in Haiti today. In retrospect, the 1965 invasion of the Dominican Republic foreshadowed a series of U.S. military actions in the Western hemisphere and beyond. Covert intervention by the C.I.A. in Latin America was as constant as the seasons, the overwhelming arrival of so many U.S. troops in the small country was a kind of political and media prototype for a pair of lightning strike invasions in the 1980's—Grenada and Panama—as well as, in more complicated ways, the relatively limited military interventions in Haiti during the Clinton and George W. Bush administrations. In each case, the man living in the White House found ways to set the media agenda for public approval to affirm the kind of desire expressed by Lyndon Johnson to Assistant Secretary of State [Thomas C.] Mann: "We're going to have to really set up that government down there and run it and stabilize it some way or other." The experience of Brazilian troops in Haiti was described by soldier Tailon Ruppenthal in his book "A Brazilian Soldier in Haiti" (Globo Publishing). He was 20 years old in 2004 when he took part in the United Nations mission for six months. "Even today, more than two years since I got back to Brazil and left the army, I can't forget what I saw there. Once when I was on foot patrol, I saw something far away that looked like a pig that that had been completely burnt. As I got closer, I started to shake and almost lost control before a horrifying sight: it wasn't a pig, but a child around three years old," recounts Ruppenthal in his book. "A soldier must have courage above all. But the collective depression starts to spread, and after a few months even getting out of bed is hard. You remember that you will cross paths with all those people who are starving but there's nothing you can do," writes Ruppenthal. In another part of the book, Ruppenthal describes what happened during a visit from then-United Nations Secretary General Kofi Annan: "The shooting was petrifying. There were bullets flying everywhere. You couldn't tell from where in the slum the bullets were coming and so the soldiers started to shoot blindly, setting off the biggest barrage of bullets that I experienced in the peace mission. The whole situation was out of control, and within one or two minutes bullets were flying from every direction." When Ruppenthal returned to Brazil his behavior changed. "I was very aggressive and started to drink a lot. My mom noticed how much I had changed, and we found a doctor who diagnosed post-traumatic syndrome. I would need to receive psychological help. We approached the army, but they refused to help me, claiming that they examined me upon my return and found nothing wrong with me." And he sums up, "And I just would like to remind everyone that we are losing the real war: against poverty.… Only the fight against poverty will bring peace. When will they see that?" Unfortunately, Ruppenthal's opinion and the many criticisms of the negative role the United Nations troops play in Haiti are not taken into account by the Brazilian government. The Brazilian government's policy in relation to Haiti serves to legitimize a coup d'état and strengthen United States interests in the region. From the Americas Program of the Center for International Policy.